Pen conditions in southern Alberta are considered fair to good, which is making it easier to bring in the lighter weight categories. Feedlots in the irrigated regions have sufficient forage while fodder or silage supplies are rather snug in other regions of Western Canada. 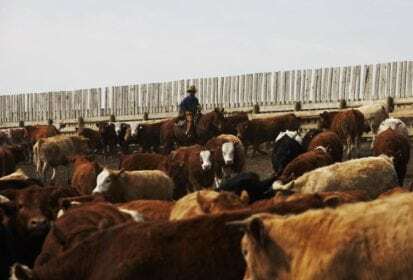 This situation has favoured demand for calves from southern Alberta feedlots while major feeding operations north of Calgary are focusing more on yearlings. Charolais blended steers weighing 510 lbs. were valued at $252 landed in Lethbridge area feedlot; black and mixed heifers averaging 525 lbs. were quoted at $208 in the same area. In southern Manitoba, Simmental-based steers averaging 580 lbs. were quoted at $226 while Hereford blended heifers weighing just over 600 lbs. sold for $186. Higher-quality packages in the eastern Prairies were also very strong but demand was limited at the higher levels.